The Buckingham Walnut 2 Door Combination wardrobe is an elegant piece of bedroom furniture from our Buckingham bedroom collection. The Buckingham Walnut 2 Door Combination provides ample space to hang your clothes with the hanging rail, along with an internal shelf plus the addition of a storage drawer. 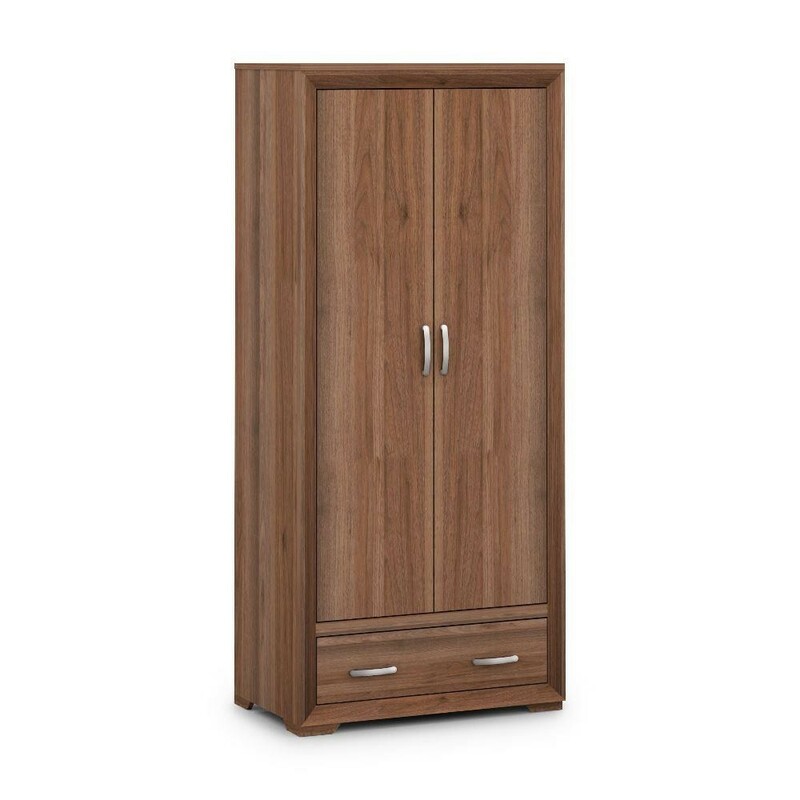 This 2-door wardrobe has a walnut effect finish, creating a warm and inviting wardrobe for the bedroom. Only quality materials have been used in the construction of the Buckingham Walnut 2 Door Combination wardrobe. The walnut effect is highly detailed, resulting in a realistic walnut look to the piece. The walnut effect is continued internally, resulting in an expensive looking wardrobe. The mitred detailing adds to the design, resulting in a wardrobe that works in both traditional and modern settings. The Buckingham Walnut 2 Door Combination is a beautiful, quality made wardrobe that has 2 doors. Inside there's a hanging rail and an internal shelf, perfect for storing containers, jumpers or larger pieces of clothing that don't require hanging. The addition of the drawer is a welcomed addition, providing plenty of much needed storage. The Buckingham Walnut 2 Door Combination is perfect for single or double bedrooms and beautiful enough for guest bedrooms and suites. Organise your clothing with a quality wardrobe from the Buckingham bedroom collection. Use the Buckingham Walnut 2 Door Combination as a standalone piece or combine with other pieces of furniture in the collection. The Buckingham Walnut 2 Door Combination is a beautiful wardrobe, suitable for storing clothing, shoes and other belongings. The walnut effect is realistic and beautifully offset by the addition of the 2 chrome door handles and 2 chrome drawer handles. The mitred edges of the wardrobe result in a modern and fresh look for the bedroom. The product is part of the Buckingham Walnut Wooden Bedroom Furniture Collection.